Aaaron Starkman, an entrepreneur in Toronto, has created a very useful invention for dog lovers everywhere. The invention came out of a close call with Starkman’s own dog Hefty. Starkman told the Toronto Star, that he had gone into the store for what he thought was going to be a quick two minute in and out trip. It was also pouring down rain when he went into buy a camping stove. When it was all said and done the trip into the store had taken 20 minutes and when Starkman came out it was bright and sunny. Hefty wasn’t so bright and sunny and had been trying to get out of the car. Luckily for Hefty and Starkman, Hefty survived the 20 minutes in the car. Starkman immediately went to work on a warning device for dog owners. Starkman did make sure to tell the Toronto Star that he was in no way advocating to leave dogs in the car or other heat situations, but when something occurs he’s hoping his dog collar monitor can help. The high tech collar is really rather simple. It consists of a few LEDs, a coded chip, a thermistor and a SIM card. 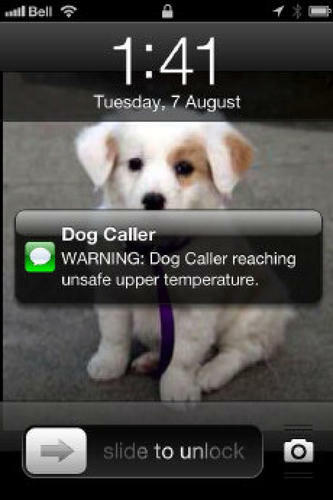 The dog collar uses the sim card and telephony to send a text message to the owner when it gets too hot for the dog. If the dog is stuck in the car or perhaps if the power goes out in the house and the dogs temperature rises, the owner is notified by text and can immediately fix the situation. The project was developed in conjunction with a team at Rethink an ad agency in Canada where Starkman is a partner. The dog lovers at Rethink quickly embraced the side project. They also created a campaign called “Doggy Havens” which included a web presence, and an advertising campaign. Through “Doggy Havens” pet owners can find dog friendly stores where they can take their pets inside, outside of traditional pet stores, to escape the heat or just take along as a shopping buddy. As for the dog collar, Starkman and Rethink plan to take it to Kickstarter, where I’m sure it will be warmly received. After that they plan on selling the collars for $20 which is a great price to save an animals life.